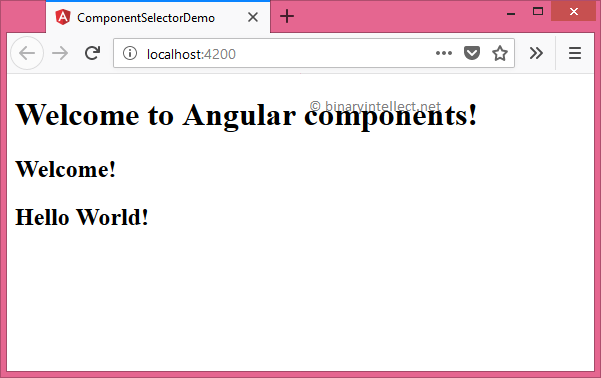 Components are building blocks of any Angular application. Most commonly Angular components exist as custom markup elements in the template. However, that's not the only way to use components. You can also use them as if they are an attribute of an HTML element. Or you can also use them as the value of class attribute on HTML elements. 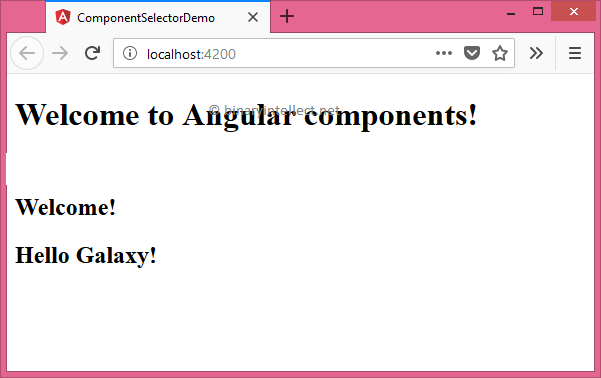 Using Angular selectors you can decide how a component will be used in the template markup. To that end this article illustrates each type of usage with a simple example. These three components represent the three selectors of a component namely element selector, attribute selector, and class selector. Now let's add some code and markup to these components and see them in action. Notice the code marked in bold letters. The @Component decorator specifies the selector to be an element - app-element. This indicates that the Element component will be used as a markup element. The above code also defines a property binding using @Input() decorator. The message property has a default value - Welcome. If you don't set any value for the message property while using this component the default value will be used, else whatever value you specified that will be used. The template of the Element component simply outputs the message property using interpolation. 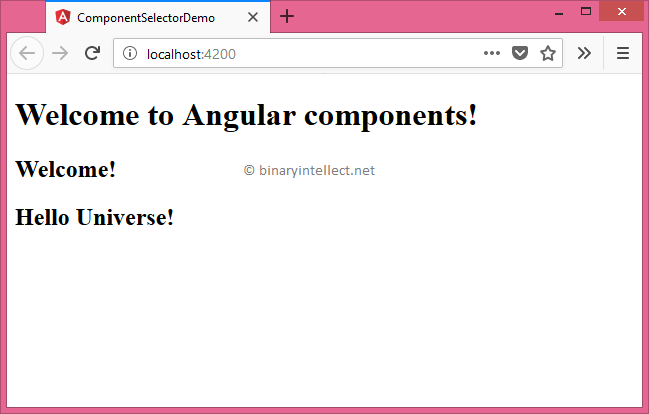 The first instance of the Element component doesn't specify any message property whereas the second instance sets the message to - Hello World! Notice the code shown in bold letters. This time we used attribute selector - the component name enclosed in square brackets. The template of Attribute component is same as before and simply outputs message property. In this case you didn't use the component as an element. You used it as an attribute on the <div> element. You could have any other element also such as <span> or <p>. Notice how the second instance sets the message property. In this case we use class selector (notice the dot before app-class). That means our component will be used as a value of css attribute. Notice how the first instance specifies the app-class in the class attribute of a <div> element. You could have also used other tags such as <span> and <p>. Also notice how the second instance sets the message property.